It’s time that we talk about paleography – the study of handwriting. (Bear with me, we’re also going to make Almond Jumballs!) Without specialized training, Alyssa and I wouldn’t be able to read the historical recipes that we cook, research, and write about on this site. The archive of early modern manuscript recipe books is written in a mix of the two most common styles of handwriting: secretary hand and italic hand. Can you read these two recipes? The first hand has more italic features and the last one is a classic secretary hand. If you’re looking for more resources, this website hosted by Cambridge University has a great online tutorial and the Folger Shakespeare Library hosts a resource guide here. If you liked the experience of grappling with historical scripts, we encourage you to participate in Shakespeare’s World, a community transcription site developed by Zooniverse and the Folger’s Early Modern Manuscripts Online project. Alyssa and I learned how to read medieval and early modern handwriting when we were graduate students at the University of Pennsylvania. We both participated in a student-run Paleography Workshop and I took a week-long course with Heather Wolfe, Curator of Manuscripts at the Folger Shakespeare Library at the Rare Book School at the University of Virginia on “The Handwriting & Culture of Early Modern English Manuscripts.” These experiences gave us the tools we needed to conduct our doctoral research and launch this project. In addition to providing you with tasty updated recipes and interesting background information, we have always included “semi-diplomatic transcriptions” of the original recipes completed to a high academic standard. Many of these recipes have never been transcribed before and posting them online in this readable form is one of our contributions to the field of historical food studies. I’m currently in residence at the Folger Shakespeare Library working on my book project, but when my former paleography teacher Heather Wolfe asked me to talk about historical recipes with her Introduction to English Paleography course I jumped at the chance. I love the “Chacolet” recipe we made this winter from a Folger manuscript and wrote about for the Collation blog. We also had a great time giving a talk at the library last December. Within a few minutes of discussion, Heather and I had settled on a cooking project in addition to a visit to her class. 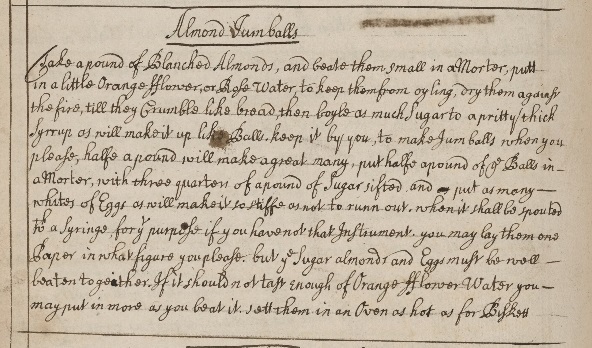 Last week I cooked “Almond Jumballs” from Folger Manuscript V.a.429, fol. 52v with Heather, members of her class, and library staff and interns. It was a blast! This manuscript contains the handwriting of three (or more) individuals and it was used in the seventeenth and eighteenth centuries. Two sets of ownership inscriptions grace the opening leaves (above). The opening pages of the book are beautifully planned and decorated with remarkable calligraphic flourishes. Although the red ink disappears from later sections, the manuscript is neat overall. The index at the beginning seems to have been updated as recipes were added. This recipe has it all: lots of manuscripts have recipes for “jumballs” (like the one we posted a while back), the script included some tricky letter forms, and the recipe required fairly simple ingredients and methods. We knew we could make it in the Folger’s on-site tea kitchen. While I went into the classroom with a general plan for how to prepare the jumballs (we’d already purchased ingredients, after all! ), we did ask the students in the course to consider how they would translate this recipe into actual ingredients and steps. They asked great questions which forced me to rethink my draft recipe both at the start and while we were in the kitchen. There are two especially interesting things about this recipe. First of all, it instructs you to make a flower-water flavored ball of almond paste from blanched almonds and sugar. Presumably this mix might have been a shelf-stable item. Then, when you’re ready to make the jumballs, the recipe instructs you to pipe the batter through a syringe or otherwise shape them elaborately. Although we made valiant attempts to shape our jumballs, our dough did not cooperate. We even tried piping it through a plastic glove with a snipped finger since we didn’t have a pastry bag! As a result, the egg measurement in our recipe below asks you to add egg whites one at a time and pay attention to the consistency of the mix. Mix together ground almonds and flower water. Toast the almond mix for about 2 minutes. Remove when the mix starts to brown. Make a “thick” sugar syrup. Bring 1C sugar and scant 1C water to a boil until the sugar is dissolved. This will produce about 1 1/2C sugar syrup. Add the sugar syrup 1/2C at at time to the toasted almond mix. At this point you can form the mix into balls and divide into batches (if you prefer). Raise the oven temperature to 400F. Put the almond mix balls in a large mixing bowl. Stir in 2C sugar (for the whole amount). Separate your eggs. You can either whip your egg whites to produce a slightly fluffier jumball or skip this step to create a chewier jumball (see results discussion below). Add egg whites to the almond sugar mix one at a time (approximate if whipped) until your dough is moist and pliable. You should be able to roll a piece of it into a log on a flat surface. Shape your dough into twists, letters, etc. Write your name, make a funny face, shape a flower, and have fun with it! Place your jumball shapes on two or more greased baking sheets. Bake at 400F for 20 min until the jumballs are lightly browned. Fresh from the oven the jumballs were chewy, sweet, and fragrant. A day later they were like hard macaroons. We were pleased with how they turned out. They were nothing like the buttery seed-filled shortbread-like Jumballs Alyssa and I made in 2014. Every recipe book seems to have a receipt for Jumballs and we look forward to exploring more versions with you soon. Alyssa and I always learn when we cook together, but cooking with a group was a new experience for me. With so many people completing tasks and offering opinions, we collaborated to make a better version of the recipe. For example, we weren’t sure if we needed to whip the egg whites or not before adding them to the almond and sugar mixture. By dividing the almonds into two batches, were were able to try both approaches. After trying and tasting both versions, we decided that the whipped egg whites added fluffiness, but because of the density of the almond mix they did not add enough buoyancy to make the step absolutely necessary. Others preferred the denser texture of the batch with the normal egg whites. My recipe above includes both options. Here at Cooking in the Archives we believe that people can learn a lot about early modern recipes by reading them and cooking them. I can’t wait to here what else the Introduction to Paleography students find, try, taste, read, and learn as a result of this training. To boile Chickens on sorrell sops. Ah! It’s been ages since you last showed up in my reader. So glad to have this new recipe and to read about how you learned to read the handwritten script. Thank you for continuing this work. What a marvelous discovery, your web project. As someone who works with almonds and almond paste, I wonder whether the almond flour was over-toasted in your experiment. I would also consider a higher baking temperature if the temperature “as for biscuits” can be interpreted in the modern sense, on the high side 400F to 450F. Then the jumbles would bake quickly and only until set. This would produce a crisp exterior and moist interior in the cookies at least for the first day or two. So happy to find you.